The Agritourism La Dragona is near a small village called Montegiovi (595 m altitude), in the province of Grosseto. This northeastern part of the province, near the border to Siena, belongs to Monte Amiata, which is not only famous for villages like Castel del Piano (5km), Arcidosso (approx. 5 km) or Santa Fiora (approx. 14 km), but for its beautiful nature which invites for long walks through pine forests and chestnut-trees. The estate is in a quiet place with a magnificent view of Montegiovi – if the weather is good, even the hills of Siena are visible. 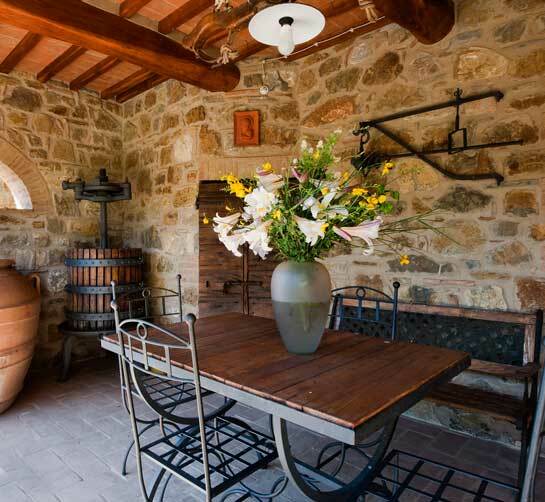 Those who enjoy wine will be given full satisfaction because famous wines like Brunello or Montecucco are grown here and taste exceptionally in combination with the delicious Tuscan meals. In the last few years La Dragona was restored very carefully with consideration of every little detail to offer an ambient for the guests that promises unforgettable and perfect holidays. The typical stone house was divided into 4 large holiday flats and one single apartment. Each unit has a separate entrance and a private, sheltered terrace. The next possibilities for shopping are in Arcidosso or Castel del Piano. Nearby there are two restaurants ( approx. 1.5 km). The next sandy beaches are Principina a Mare or Marina di Grosseto in nearly 60 km distance and a lot of famous sights and worthwhile destinations like Montalcino (30 km), the hot sulfured springs of Saturnia (40 km), Pienza (40 km) or Siena (70 km) and many other activities.